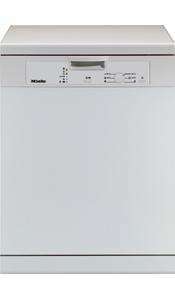 After searching for a quality dishwasher I came across this Miele AAA rated G1022 at M&S. At £411 this was hard to beat and gets fantastic reviews. Typically about £520 at most retailers, next best price is Currys at £441 using 15% off code. Free weekday delivery is availible. I ordered it this morning from M&S, don't forget 2% quidco (takes this to £403). These are brilliant dishwashers, spend half the money on a cheap make and it will last a year, we are on our 2nd Miele, now trouble free for 5 years, the previous one lasted 8 years. Great price! With Miele at this price you get more than what you pay for. Had a Miele washing machine - it broke after just 5 years light use. The company weren't particularly interested in helping either, despite claims that they are meant to go on for over 10 years. Replaced it with a Bosch which has been great. When our dishwasher died last week (albeit a 13 year old Zanussi), we replaced that with another Bosch appliance and have been very pleased with it. they certainly dont have the reputation of bosch.. or Miele for that matter. um... Hotpoint are part of INDESIT group, not Bosch group … um... Hotpoint are part of INDESIT group, not Bosch group (Bosch/Neff/Siemens)they certainly dont have the reputation of bosch.. or Miele for that matter. My Hotpoint dishwasher was made by Bosch, and is still going strong after 12 years, on the other hand my youthful Miele washing machine has never really cleaned particularly well, my Miele fridge died after 8 years and one repair, which cost nearly as much as the replacement fridge. These are brilliant dishwashers, spend half the money on a cheap make and … These are brilliant dishwashers, spend half the money on a cheap make and it will last a year, we are on our 2nd Miele, now trouble free for 5 years, the previous one lasted 8 years. Great price! With Miele at this price you get more than what you pay for. Our 'no name' dishwasher, installed by the builders, is approaching its 20th birthday. I'd be disgusted by any dishwasher which only lasted 8 years, let alone a mega-bucks Miele! Our 'no name' dishwasher, installed by the builders, is approaching its … Our 'no name' dishwasher, installed by the builders, is approaching its 20th birthday. Aaah Bless! Are you havin' a party?